What do you believe to be the object of your life? Is it to be happy and successful? Many people believe that if they are both happy and successful that their life would be perfect in every manner. Is that your thinking? There are those who think that following a lifestyle based on the belief of a particular group and living out their life in a perpetual state of misery, poverty, and sorrow is the object of life. They are of the belief that the real reward is in the hereafter. And, even among those who hold this belief, there are those who will ask, "Do we not deserve to live a life of happiness in the now?" Why can we not have both a certain level of happiness in the now and the afterlife, if it exists? There are those who believe that it is pure folly to risk everything on some unknown future. They perpetuate the belief of Carpe Diem — to seize the day — and to make the most of the present time and give little thought to the future. However, is it fair to consider happiness as being successful only because of the accumulation of wealth, or having achieved some level of fame? And, unfortunately, there are those who are codependent in that they have an excessive emotional or psychological reliance on others, And, we must include the enabler of the codependent in this group who set aside their happiness and success in life, to allow the codependent to never having to accept the responsibility of their life. Did you find yourself in any of the above situations? For the great majority of successful individuals —who think clearly in their observations of the world — the most sought-after object of life is to have character. 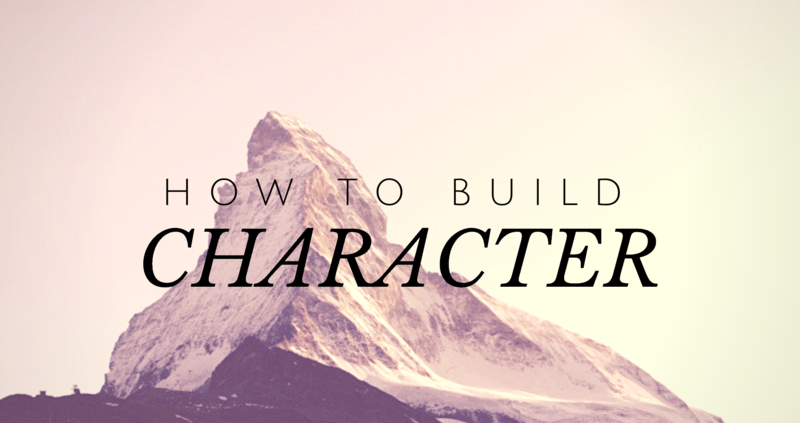 Character is the mental and moral qualities distinctive to the nature of an individual. It is what makes an individual interesting to others and is seen as a strength and originality, as having a good reputation. You cannot achieve character acting in a desultory manner — lacking a plan, purpose or without enthusiasm. You cannot achieve character by moving from one thing to another in an unfocused manner. And character is not achieved by acting randomly or working in an occasional manner. You must apply ambition and purpose. If one sets out to build a good character with ambition and purpose, they will be both happy and successful. Those with good character will never be viewed as a failure. The accumulation of character cannot be bought, and you cannot acquire it as a gift from others. It is a solo effort, to be done by yourself. It requires introspection. It requires clearing your thoughts of misguidance. It requires work that cannot be done in a single sitting or a six week period. It will take time and effort. It is a goal that will encompass your life in everything you think, say or do. The building of character is what you do for yourself to achieve happiness and success in your life. In doing so, you act as a mirror for others to reflect on their own life. "An important lessons in life is that you alone cannot change another person to be what you want them to become." You are not responsible for what others will see of themselves when they look into the mirror. Others must accept their responsibility at all times. You cannot, nor should you, ever attempt to accept the responsibilities of others as your own. If you set out to change others and they fail, they will only blame you for their misfortune. Having good character alters your world in a very positive manner. It allows you to attract a much stronger social community that consists of like-minded individuals. You will find yourself in the midst of individuals that have even higher character than yourself that you can mirror and improve your character. If others see you as honest and honorable, as a reliable and responsible individual, you will earn their respect. Others will trust you, in knowing they can depend on you and will want to be involved with you on a social or business level. The relationships that you attract will be deeper and more meaningful. Others will see the positive benefits of your good character and serve as an opportunity to help others achieve more in their own life. Others will appreciate your high ethical standards in your personal, business, and community life. You will continue to grow in self-control, be able to judge situations with charity, increase your sense of justice, be more generous in your usefulness with others and be unselfish. The greatest benefit of having good character is the self-esteem that you gain. Those with character have greater confidence in their worth or abilities. You feel good about yourself. Finally, there is the aspect of having the virtues of honesty, morality, and ethics. Once you are on your path to good character, you will find it easy to maintain, by keeping the guiding principles of your purpose and direction you wish to reach in mind. You should strive to assure that your every step is will take you in the right direction to attain good character. Know that your actions will determine what people think of you. This will help to establish your reputation. Others determine their level of respect for you based on what you think, say, and do. Always assure that you are honest, honorable and forthright in all that you do. There should never be an implication of dishonesty. Never attempt to mislead or misdirect others with your advice. Never make assumptions. When asked for advice, put yourself in the shoes of the other person and what will be good for them in their particular circumstance. Don't guess! Ask questions until you have a very clear picture of what the other person needs and wants to achieve before attempting to guide them. Always be considerate of others and conscientious. You do not have to be perfect. No one is perfect. It will show others that you are striving to be of good character. Cease complaining and criticizing others. Find solutions to problems, rather than berating those who did not. Your word is one of the most powerful tools you have. Be faultless in your words, so that your behavior, performance, or appearance is by the highest standards of propriety. Remember that how people see and treat you is only a projection of who they are. You should never take anything that others do or say to you personally. They are only projecting their thoughts and actions in the only way they understand. Maintain your good character and hope that they will reflect what is good about you and take heed of their errors in judgment. Build up the skill and the courage to communicate, and you will easily turn any dislikes towards you into loyalty and respect. Always strive to do your very best, assuring that you continually improve on how good you do. What you do at your best will change as you move forward in your goal to build character. You will never be the person you once were. If we do our best and improve, we can avoid being our own worse critic and eliminate all the unnecessary self-judgment, self-abuse, and regret. Like all individuals, I am not perfect, and I constantly find myself able to see where I need more work to build my character. When I see myself misstep, I see it as having room for improvement, I simply tell myself, “I can do better!" And, I set about to find ways to improve myself and build my good character. Be honest, reliable, responsible and courageous. Understand that your reputation is everything in how others see you. Your reputation for having good character will result in attaining the respect of others and provide you with greater self-esteem. Your journey will be long and at times difficult, but in the end, you will be able to look back and not have any regrets on how you lived your life. Having good character is very much always doing the right thing, the right way.